When it comes to file management solutions, Syncplicity is considered as one the leading company that offers automated synchronization, backup recovery, document sharing & work together features all summed up in an integrated solution. Individual consumers and businesses can gain unprecendented storage and file management capabilities. Syncplicity, as the name narrates provides automated synchronization with ease and simple process. Syncplicity is an EMC company offering mobility and collaboration over a single platform. It provides user encrypted controlling of data across all their devices, cloud management application and over their corporate network. 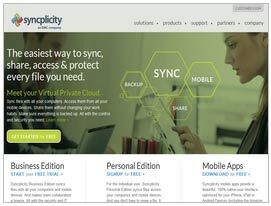 Syncplicity is revolutionalizing the way people handle, store and share their files. Through their own virtual private cloud users can do wonders with their work documents and personal stuff. It give liberation from complex computing environment by allowing clients to access digital data from anywhere on system, mobile device or business application – online and offline. The striking feature of file management through web based interface or desktop manager is highly regarding by clients as it assist them to schedule and prioritize their task according to level of importance.